Nope . . . never been on safari! Imagine it would be totally exciting . . . altho’ I think I might be a bit more comfortable not being quite so close to the amazing wildlife on safari! Graphic 45’s “Safari Adventure” is such FUN paper to work with! 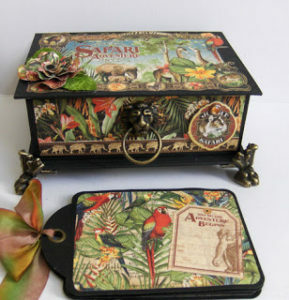 My next workshop at “It’s All About the Scrapbook” in Dixon, CA, will be Saturday, August 27th and we’ll be making this jungle themed keepsake box and a tag mini-album to go inside it. The box comes with three tags on a metal ring. 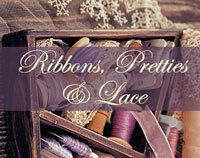 I chose to use, instead of the ring, some gorgeous Hanna Silk ribbon. You’ll get a set of the Safari Adventure 8 x 8 papers, and all the hardware and embellishments shown, to create your keepsake box. (the inside of the box is lined with papers, also). You will also have the option of either the metal clawfeet (shown) or round painted wooden “ball” feet, for your box. (or, if you like, no feet at all!) 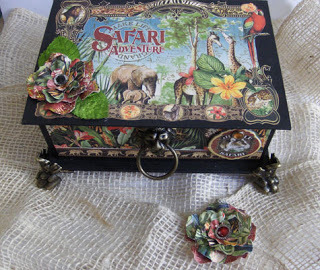 You can do as much, or as little, “fussy cutting” as you like, to decorate your box. Come “safari” with me and share some wild fun! See you there! 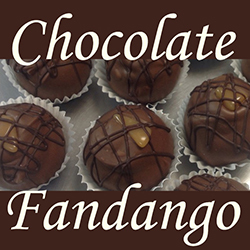 (Class is $35; call the store to register . . . (707) 676-5252. Call now! Seating is limited! New classes & dates to remember! Flowers were blooming April 7th!! Botannical Tea Folio Card . . . . MY FAVORITE!! Look for my upcoming classes!